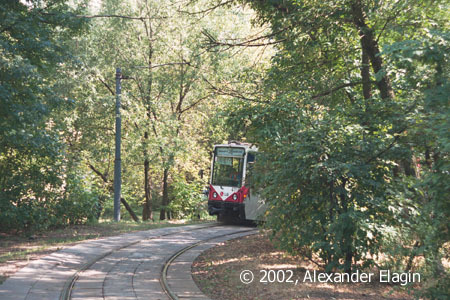 A quite small reversing loop Nizhniye Kotly is located near Varshavskoye Shosse in the southern districts of Moscow. The name of this loop reminds of a village with the same name that was here decades ago. The village exists no more, today this area is just another residential district, but the name is enduring. 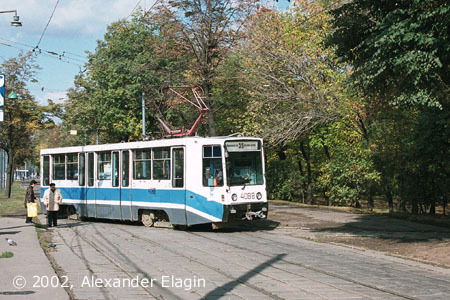 The loop was used in 2001-2003 by route 35 as a provisional terminus. Here you can see KTM-8 #4088 preparing to reverse. The loop is very simple, with just one track. It is located on an embankment in the middle of a large public garden. As you can see the trees almost completely hide the loop from view. 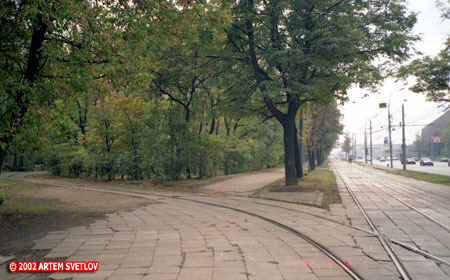 The exit from the loop to the main line along Varshavskoye Shosse. Probably there was either a shelter or the second track here but no traces except for the wide embankment remain.